This project is already advancing towards the creation of accessible tourism products based on greenways. 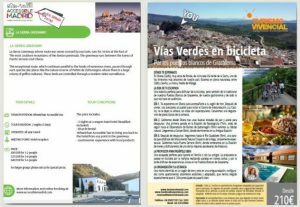 With the knowledge of the real offer of accessible tourism in the two pilot territories on which this project is focused – Vía Verde de la Sierra. Cadiz-Seville and Ecopista do Dao Viseu Dao Lafoes region. Portugal –, after the initial few months the project is already in the creation phase of an accessible tourist product based on greenways. Some data. For the Vía Verde de la Sierra greenway, 134 resources were analysed by telephone, 69 of them being eligible for auditing in terms of accessibility by complying with the minimum criteria. Once all of them were analysed, 43 of them were found to be accessible or usable. The 3 SMEs taking part in this project, Accessible Madrid, Turismo Vivencial and AstroAndalus, together with the partners in the territories, visited the companies and the accessible tourist resources of the pilot territories during March 2017. The project partners are already working on the design and creation of tourist products and including in their tourist packages all the details of the specific offers selected by these travel agencies and tour operators. This work phase is scheduled to be completed in June and a total of 7 products are expected to be created in the two territories. Once the tourist packages are ready, they will be integrated into the tourist marketing channels of these 3 travel agencies, and uploaded onto specialized portals and platforms such as www.viasverdesaccesibles.es, www.spain.info, www.viasverdes.com, www.greenways4all.org, Tur4ALL app for Spain and Portugal, www.pantou.org and on the websites of the territory´s partners.